DSTRYRsg: Destroyer Submission Grappling and Brazilian Jiu Jitsu: STAY INFORMED, GRAPPLER. IBJJF HONOLULU OPEN CLASS FINALS (CYBORG VERSUS BARBOSA). STAY INFORMED, GRAPPLER. IBJJF HONOLULU OPEN CLASS FINALS (CYBORG VERSUS BARBOSA). So, it was a holiday weekend and perhaps you were busy wine tasting with your fiancé or playing Dungeons & Dragons and/or Ultimate Frisbee [yes, that's a real "sport"] with your friends (inclusive of imaginary). It's totally understandable that you neglected your jiu jitz for a day or two [sarcasm]. Worry not, grappler - DSTRYRsg is here to keep you legit and in the know. The IBJJF Honolulu International Open went down this weekend. Results are here. 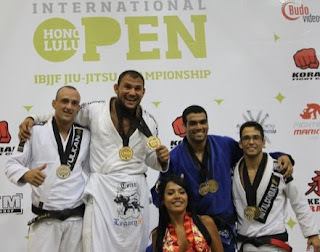 The highlight: Roberto "Cyborg" Abreu faced Abmar Barbosa in the Open Class Final - very slick, aerial jiu jitsu. Two amazing grapplers. Keep in mind that Cyborg outweighs Abmar by 50+ lbs (Barbosa is Middle; Cyborg is Super Heavy).